LOCATION: About 2 miles East of where Saltair is located today, just off of I-80 and SR202 on the way to Tooele. Take the exit to go to where Saltair stands today. On the frontage road, turn East. Go about two miles. You'll see an old train car with rubble and an old building. That is the road to where Saltair used to stand. The building and train car are on private property, so you need to go to the next gate heading East, park there, and walk down that service road. 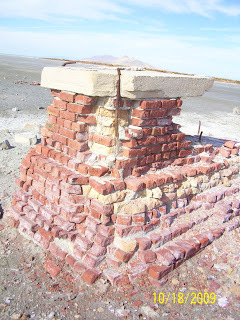 THEN you can walk over to the old Saltair road, go to the end of it, and to your left is where you will find all of the remains from the old Ship Cafe. This is an adventure that you are going to want to spend many hours doing. Make sure to wear good walking shoes! I have always been intrigued with Saltair and the area. When I was little, my mom used to take us to the beach out there. We always had a GREAT time! Then, in High School, my friends and I would go exploring through all the ruins and such that still remain of the original resort, and the train cars that used to take people there. While attending a dance at Saltair in 1997, I met my hubby Russ. I recently discovered that a picture exists of my Great Grandma in the early 1900s on the train on her way out to Saltair. Saltair has always been very interesting to me. I love seeing the turn of the century pictures of people swimming and having fun, and what a hopping place it was! I would love to be able to go back in time and live one day during that time period! 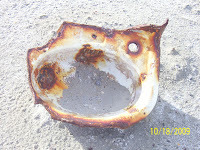 I recently read an article by The Boneville Mariner that explained how the Ship Cafe burned down in the early 1900s, and all of the dishes and such went underwater. Well, because of the recent low water level of the Great Salt Lake, all of the dishes are uncovered and just sitting out there. ADVICE: DO NOT take any of these dishes or artifacts. Becuase they are historic artifacts, you can be prosecuted, and there are people that watch! We went treasure hunting out there and it was SOOO much fun! 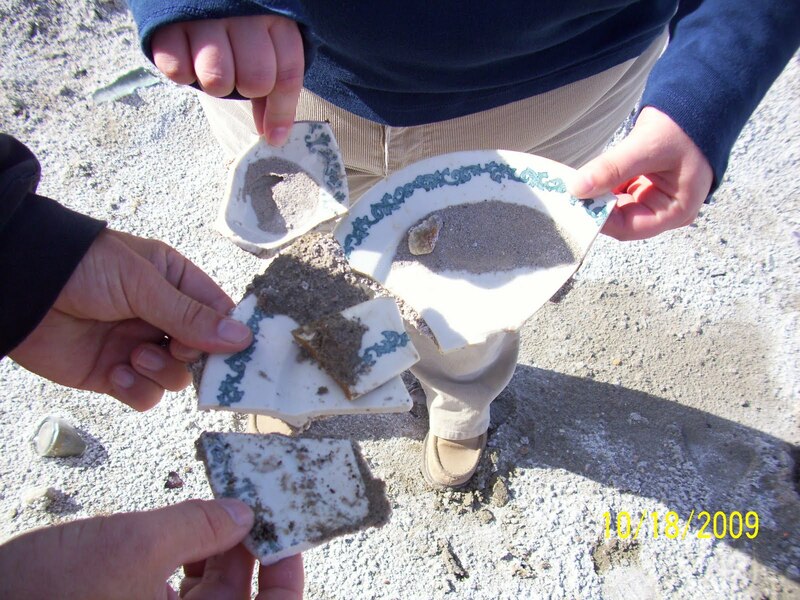 I thought we'd be lucky to find one or two dishes or cups. Oh, no! There were HUNDREDS of them laying in the sand! They've been there since the 1920s! They've just been covered with water! Ruins Are All That Remain of "Coney Island Of The West"
Bonneville Mariner has many articles about the history of Saltair. We took our kids (11,9,7,and 4) here yesterday. They had so much fun looking for treasures! Thanks for the idea! It was a fun day! Very cool! Glad you had a good time! Were you able to find a bunch of old dishes and burned sinks?! SO sad that they are all just sitting out there in the sun, since the 1920s! Did you take some cool pictures?! We have not been able to find the dishes, etc... We went last year and are trying again today. When we went there wasn't a train car. Any suggestions or more directions would be much appreciated! Thank you! We actually found it this time... After 4 miles of walking! Hooray! Thanks for your blog! Yay! So glad you were able to find them!